Courtesy of WOWSA, Lac St-Jean, Quebec, Canada. Traversée internationale du lac St-Jean is one of the most difficult, fastest and toughest professional marathon swims to win. The cross-lake swim of 32 km in Quebec, Canada is known for rough, cold water and much turbulence caused by winds over the previous 62 editions of the renowned pro race. But FINA's new water temperature/wetsuit rules have dramatically changed the dynamics of the race in today's 63rd annual event. With the water temperature at 18°C, the participants had the option to wear a wetsuit or not. All the top swimmers donned their black neoprene wear. The lead pack stayed today right up to the finish and 27-year-old Guillermo Bertola of Argentina sprinted to win the race in record time. Philippe Guertin from Montreal, Canada finished second only 4 seconds behind the Argentine winner in a 6 hour 19 minute race. "I led a good part of the [FINA Open Water Swimming Grand Prix] race and I was trying to set the pace. There were probably times I should have stayed behind a bit more and relaxed. At the end with five or six of us chasing the finish, I gave everything I had. I’m happy about that." Xavier Desharnais from Sherbrooke, Quebec, a two-time winner of the [non-wetsuit] event in 2014 and 2015, was fourth. "It was tough. The start was really fast and my arms were sore. After it slowed for a bit, it picked up a lot again. I thought I might have a chance. But the race was so fast." 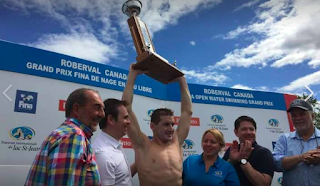 Bertola had competed in the 5 km mixed team race (13th), 10 km marathon swim (22nd) and 25 km race (20th) in the recent FINA World Championships in Lake Balaton, Hungary, so his competitive juices were honed. 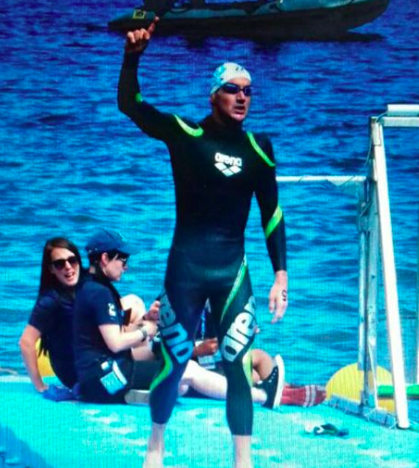 After competing on the FINA Open Water Swimming Grand Prix circuit since 2008, today was Bertola's time to shine. The results from the women's Traversée internationale du lac St-Jean are here.